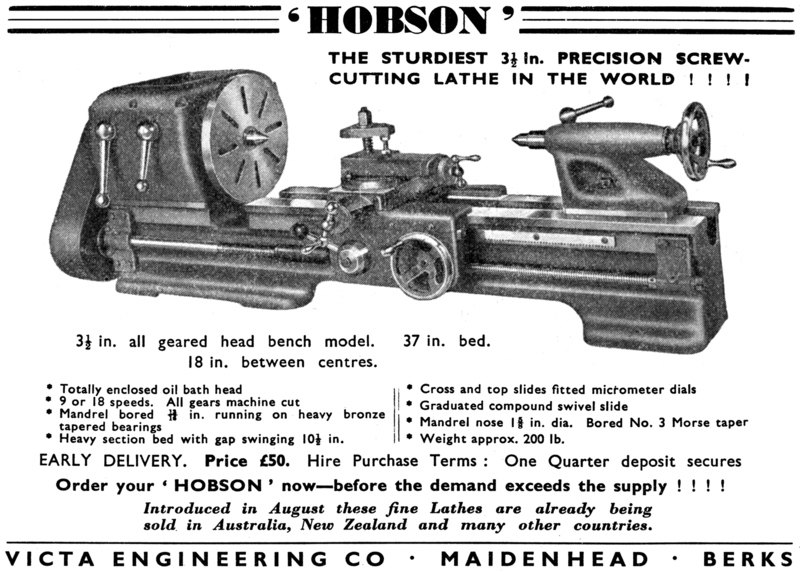 Hobson made, it is believed, just two different lathes: one was what might be regarded as a conventional 5.75-inch and, for its size, the rather unusual (and now rare) 3.5" x 18" geared-head Model H7. The machines were manufactured by Victa Engineering at their Tollgate and Cordwallis factories in Maidenhead, England. The Victa Company, although a small-scale affair with few employees, appear to have been involved in numerous projects concerned with small machine tools: the well known and beautifully-made Centec milling machine dates back to the early 1940s when the model was introduced as a development of the V.E.C. or Victa horizontal miller - a machine also occasionally found badged as a "Warwick". 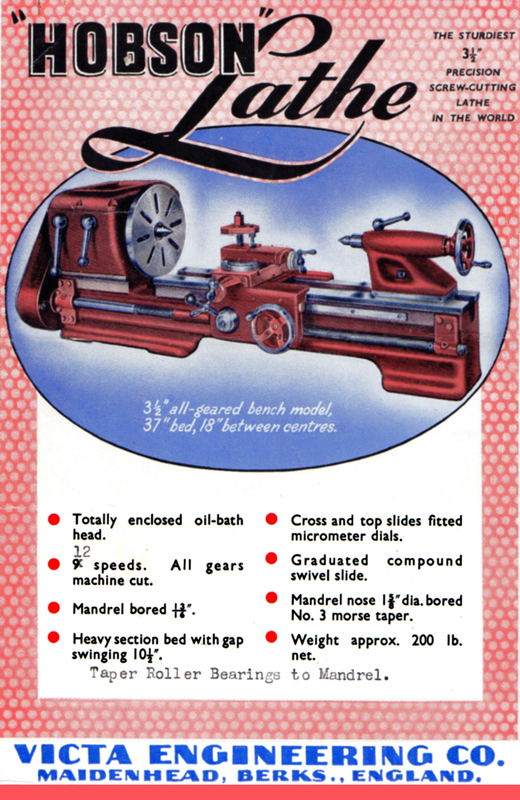 During the 1940s and early 1950s Victa also produced lathes and, besides the range of rather advanced geared-head types sold using the Hobson label, they marketed the "Warwick", a 3.5" x 18" gap bed, backgeared, screwcutting and belt-drive type designed-for-model-engineering They also made (whether under licence or a sub-contractor is not known), the Eagle hand-operated surface Grinder marketed by Dronsfields Brothers, makers of the Marlow milling machines. The company are thought to have eventually moved to Pool, in Dorset where the proprietor had a second home. Introduced in August, 1951, the 3.5-" x 18" H7 copied elements of the Myford ML7 with the tailstock, bedways and compound slide rest looking to be arranged along exactly similar lines - and dimensionally identical as well (it's known that an ML7 or Super 7 tailstock fits straight on). The bed featured 4.5-inch wide, ground-finished flat ways (using the same type of narrow-guide principle as the Myford) with the standard-fit gap able to accommodate a piece of material some 10.5 inches in diameter and 1.5 inches thick on the faceplate. However, the most unusual feature was the all-geared headstock, a fitting virtually unknown on any lathe of a comparable size. 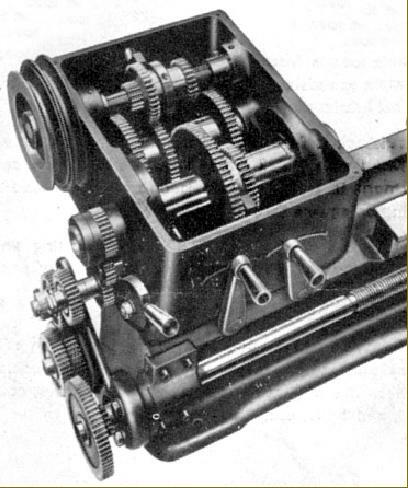 The geared headstock turned the machine into a miniature of a larger one and, at a stroke, did away with the need for the moving of V-belts as well as eliminating the need for a countershaft or exposed backgears. The headstock spindle was bored to clear 0.75 inches, turned from a solid 2.25-inch diameter steel bar, ground finished and ran, at first, in tapered bronze bearings with a choice of either nine or eighteen speeds. 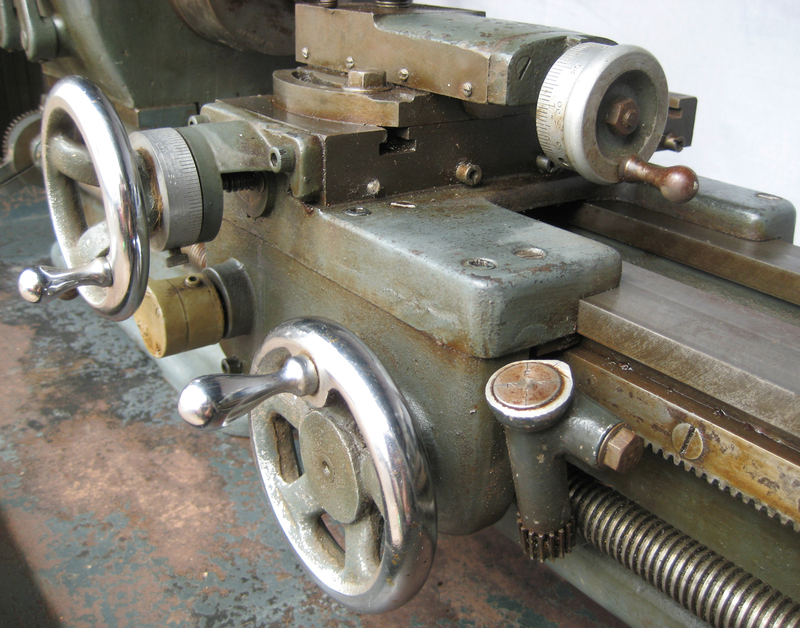 However, the cost of the bearings--and presumably the additional difficulty of machining and installing them - resulted in a change to a taper-roller type; so far, not a single Hobson with bronze bearings has been discovered, presumably because so few were made. The 15/8i inch threaded nose accommodated a No. 3 Morse taper and was driven (on all roller-bearing headstocks) through 12 speeds of 30 to 1500 r.p.m (6 geared and 6 more from the double-step drive pulley) by a 0.33 or .05 h.p. motor though a 1/2" V belt. Screwcutting was by changewheels - there appears to have been no gearbox option, though as an example of how close the H7 was to the Series 7 Myford, at least one owner fitted the screwcutting gearbox from an ML7 - a picture is at the bottom of the page. The tumble-reverse mechanism was crude, and required a bolt to be undone before rotation of the acme-form, 0.75-inch diameter leadscrew could be reversed. 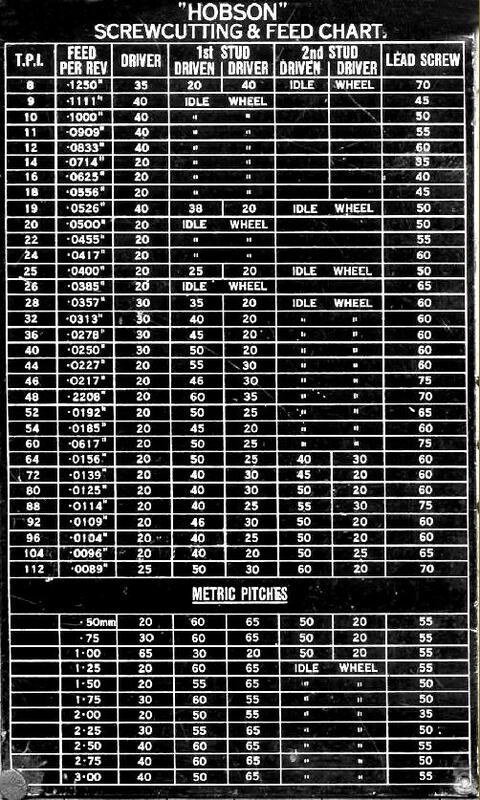 With the standard set of changewheels (it is though that 16 were included) inch pitches from 6 to 96 t.p.i. could be generated and, with metric-translation gears in place, from 0.25 to 4 mm. Closely resembling that on an ML7, the tailstock featured a 2.5-inch, No. 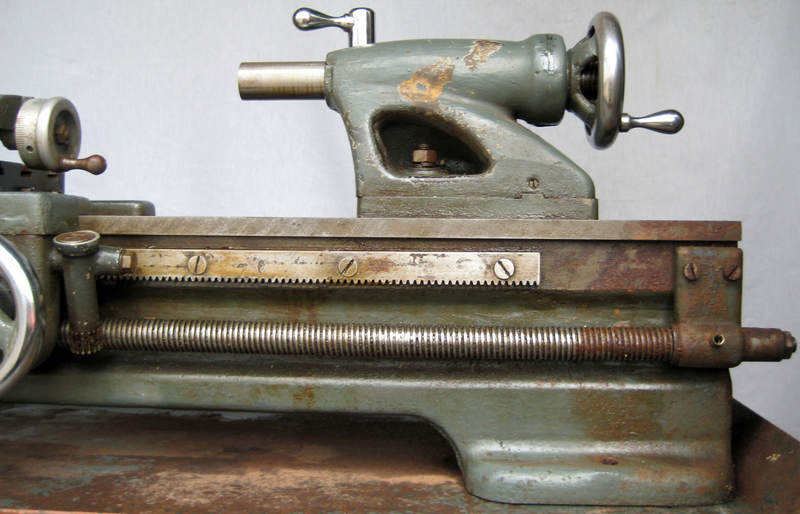 2 Morse taper ram with a square-section thread that passed through the handwheel. Set-over of 0.5-inches was available for the turning of slight tapers. Publicity literature issued for the lathe contained several differences and, whilst one set confirmed the roller-bearing headstock as standard and the provision of 12 speeds, in the Model Engineer magazine for October 1950 an advertisement claimed 9 or (optionally) 18 speeds were provided (the 18 presumably by a double-step pulley on motor and headstock input shafts) and that the headstock bearings were 'heavy bronze tapered bearings' - not rollers. The photographs also differed from the examples shown on this page, with the ball-ended speed-change levers pivoting from the top rather than the bottom of the casting - the change in lever pivot position possibly coming about when the gearing was altered to give 9 speeds. The changewheel cover was also shaped differently - and there was no sign of either a tumble-reverse lever, or a leadscrew handwheel (though the former, being inconspicuous, would have been painted out on the publicity photographs). In the early 1950s the H7 was priced at £50, on ten-weeks' delivery, but with extra for a motor - though by 1955 this had increased to £78 with orders taking just three weeks to complete. As a comparison, in the early 1950s the Myford ML7 (on hire-purchase) came to £42 : 18s : 6d - again, without a motor. 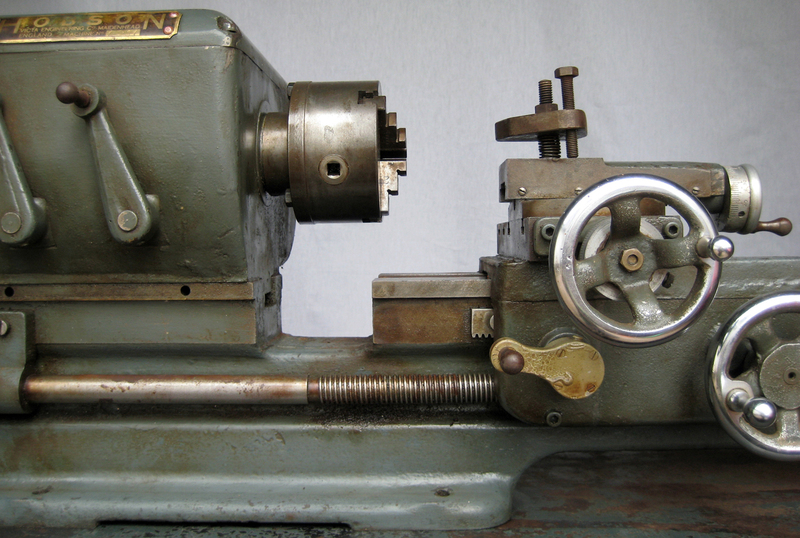 Although in mechanical terms the Victa offered very much more lathe for the money it offered no greater turning capacity - though the better range of speeds (and the ease of changing them) together with a larger hole through the spindle - must have been appealing. Understandably, in the straitened times of the second decade after WW2, these advantages may not have been temptation enough to part with an extra 16%. If the tailstock is missing from a Hobson it is possible to fit one from either a Myford ML7 or Super 7. As the gap between the bedways is wider on the Hobson, the tailstock gib block has to be enlarged to 17 mm x 10 mm and a packing strip (accurately machined of course) fitted to the opposite side. Although some of the contact face area between bed and tailstock base is lost, sufficient remains for the conversion to be effective. 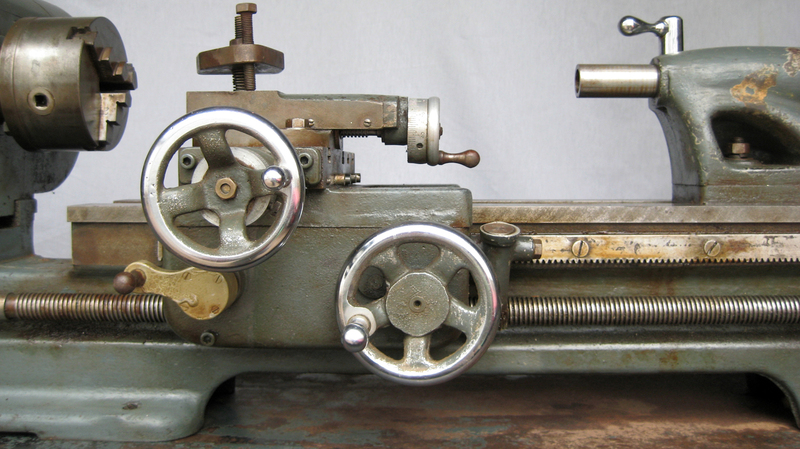 If any reader has a Hobson lathe the writer would be interested to hear from you. A larger, 5.75" centre height Hobson was also made - details here. From the tailstock end the Myford-like appearance of tailstock, carriage and leadscrew handwheel is evident. A useful T-slotted cross slide was fitted as standard as were zeroing micrometer dials. Although fitted with an expensive geared headstock in this end view two cost-cutting features are evident: the securing of the changewheel guard by a single stud and hand nut (instead of being properly hinged mounted) and a tumble-reverse lever that required the use of a spanned before the leadscrew rotation could be reversed. 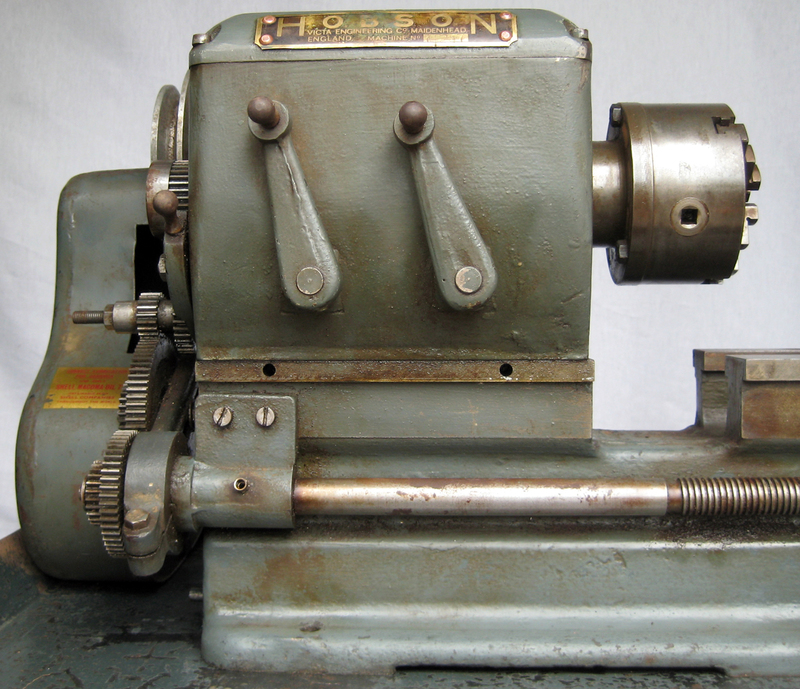 The Hobson H7 above, with a Serial No 7/101 may well be the very first (makers often favoured 101 or 1001 as a starting point) and possibly experimental model with a neatly-mounted spindle clutch assembly. 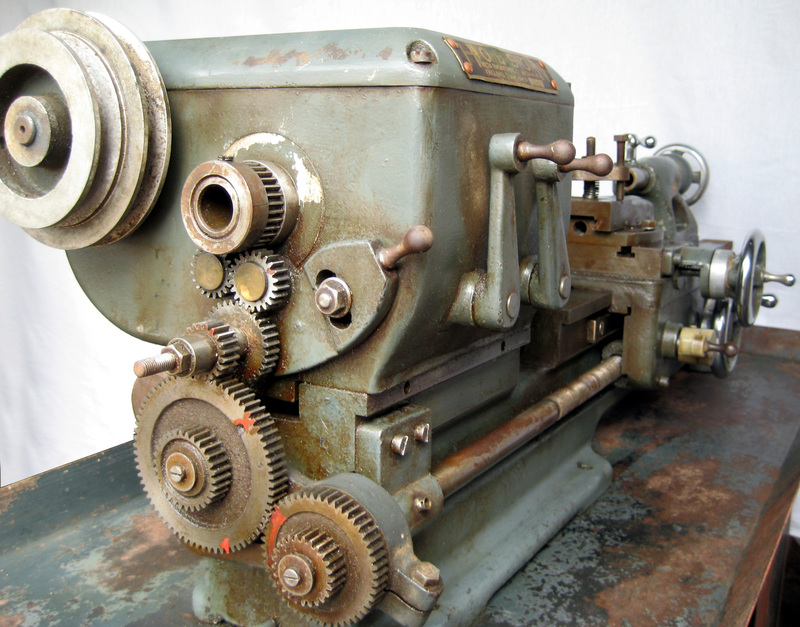 This example was found complete with a Burnerd 3-jaw Griptru chuck, two 4-jaw chucks, a faceplate, vertical milling slide, fixed and travelling steadies - and a rear toolpost.